The Friends of Tigertail Beach Organization (FOT) awarded its Second Annual Summer Camp Scholarships. 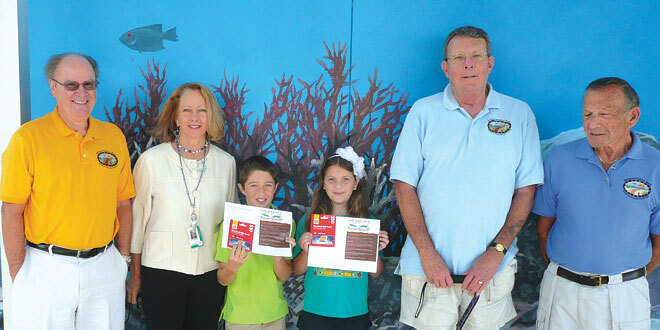 Ten Tommie Barfield Elementary students submitted essays on Southwest Florida’s ecology and natural resources to the FOT’s Scholarship Committee. The Committee selected two fourth grade winners, Alyssa Kirstein and Tyler Shute. The winning essays were shared with the FOT Board of Directors who found them to be on target and most delightful. Explorations,” will center on studying the exploration of marine life, along with exciting games and crafts. Congratulations to both winners and future conservationists! The Friends of Tigertail is a non-profit organization of volunteers dedicated to the stewardship of the unique, rich natural area that comprises Tigertail Bach and Sand Dollar Spit, and to educating the public about these places. If you have an interest in joining the organization or contributing to the FOT Summer Camp Scholarship Program, please contact Joseph Parisi, Membership Chair, at 781-864-2392. For more information, please visit the website: www.friendsoftigertail.com.